So I was talking to our brilliant and fashionable costume designer Carly yesterday and she asked if I had a particular image in mind for the movie. And good grief. I don't. I think I used to do that. But then I gave up and just let the designers design. But I really should have something over-arching. Heck. We should design the poster art first. Good enough for Hammer Films, good enough for Pandora Machine. 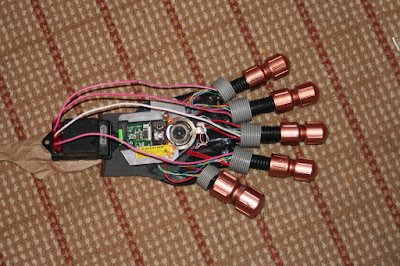 Here is the mecha-hand for Rachel in Clonehunter, built by Brian.